Demo of turtlebot2 localization with amcl. 0.0, 0.0, 0.0, 0.0, 0.0, 0.5]"
On a machine that has the ROS 1 <-> ROS 2 bridge installed, you can use the bridge to echo the ROS 2 into ROS 1 topics so that they can be visualized by RViz in ROS 1. Now RViz will be able to display the localization result. 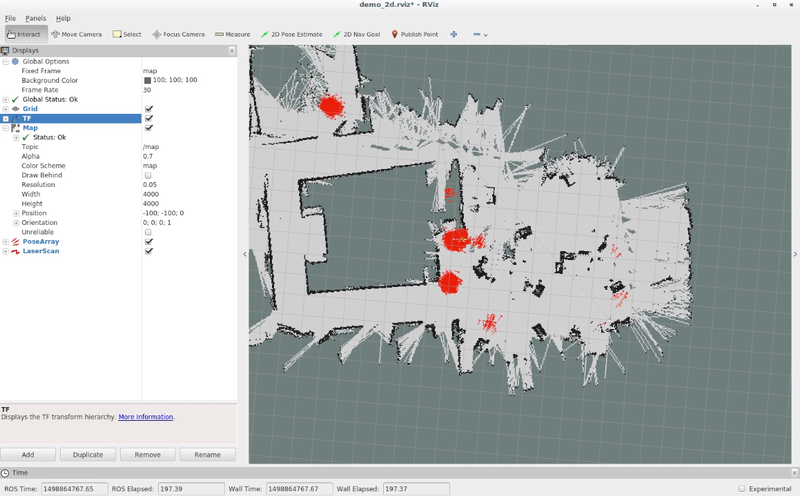 Add TF, PoseArray, LaserArray and Map displays, and you should see the particle cloud move around the map with the robot. If you only want particular topics to be bridged between ROS 1 and ROS 2, you can launch a "parameter bridge" with the provided configuration. This will bridge only the relevant topics for using AMCL. Note that services will not be bridged with this configuration, so you will need to run a map server locally.